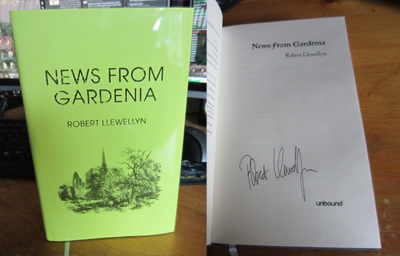 Adding to my emerging collection of signed first edition hardbacks this week is News From Gardenia. Following Peter Hamilton and John Green comes Robert Llewellyn. That's three very different authors. This was published in a non-traditional manner which definately encouraged me to help. It's been released via a company called Unbound which works similar to Kickstarter. An author sets up a page for their book and if the users like that idea they donate to the project. If the project is funded by a deadline then the book it printed, otherwise money is returned. So I reserved a copy a long time before it was printed. Usually donating more gets you additional benefits, like in my case a signed copy along with a free ebook and audio book version. It's an interesting method although obviously unless you're already an Internet star with a following, like Llewellyn's 85,000 Twitter followers, it would be hard to drum up the necessary support. I'm looking forward to reading this. Excellent news that he got enough support - authors know what their own readers want, and the days when publishers could just deny them are gone for ever, thank goodness.